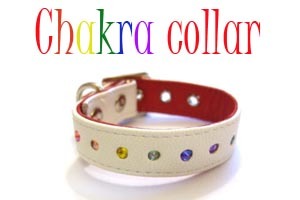 This stunning collar is a one of a kind! You choose the leather colour and we will embellish it with clustered gold and silver faceted beads and diamond crystals. .... also available in our new silver and gold metallic nappa leather for the ultimate statement in opulent fashion! Each collar is unique and clustered with an exciting mix of beautiful embellishments. These collars are style pieces for the eclectic collector! 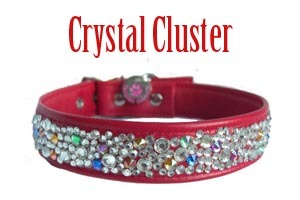 A collar in your leather colour choice clustered with gorgeous crystals, pearls and seed beads. This classic necklace is a wardrobe must for every fashionista. A poochie 'pearl encrusted necklace' collar in the leather colour of your choice with matching ivory white and coloured pearls. Animals, in common with us, have a chakra system. This system is a complex network of spinning, energy vortices which run throughout the entire body. When we realign the chakras and get them spinning in harmony and at the correct rate, you get the physical body running smoothly once again. If you would rather single colour and diamond crystals, just message us as we make everything to order so we can easily change things up for you. Inspired by the dapper gentry of the countryside, we have created this downton delight! A lovely nappa leather collar encrusted with individually sewn Autumnal colour semi-precious stones and crystals. 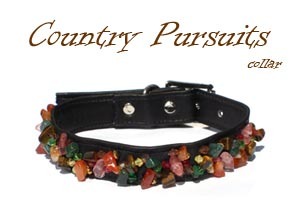 This collar will take you from Town to Country in style! The colour Purple is associated with Royalty and opulance. Our Summer special is decorated with little frosted flower beads and leaves. 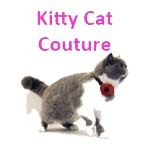 The perfect collar for a Garden party or Summer wedding. 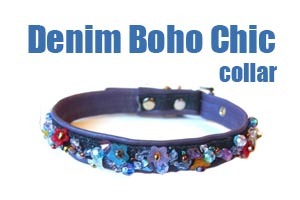 This funky fashion forward collar incorporates all our favourite boho elements. 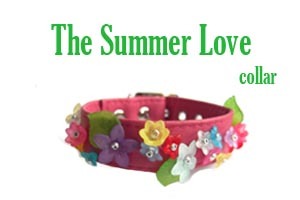 A fun and funky collar decorated with sweet charms and beads. A mixture of nostalgia and naughtiness !! choose the leather colour and we'll do the rest! 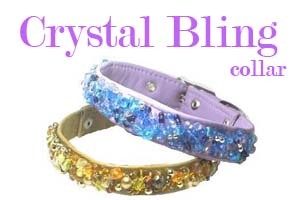 Crystal & Bead collars are not suitable for rough or active use. 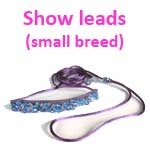 These collars have dangling or sewn loose elements so please be 'dog aware' with regards to choking hazards. If you think of the Crystal & Bead collars as items of jewellery, something that you would treat carefully and take off at night.